A lot of my global music friends seemed to take delight in shunning yesterday's Super Bowl. Me, I didn't ignore it entirely, although it wasn't until Wednesday or Thursday last week that I realized it was imminent. No, I pulled the TV over near the kitchen so I could bake bread and cook other delectables while keeping an ear on the game. I'm a regular viewer (and player) of the other kind of football, the kind the rest of the world plays. And my view of American football isn't far removed from that of George Will, who quipped: "Football combines the two worst things about America: it is violence punctuated by committee meetings." But as some sort of cultural commentator, I find value in keeping at least a tenuous connection with the popular happenings in my own country as well as seeking out the sounds of faraway lands. And it wasn't such a bad game, even for those of us with no horse in the race. On the music front, I have to admire the logistics of squeezing a major stage show onto a grass field with just a few minutes for setup and teardown, and I'll admit that Madonna is a consummate entertainer, if not particularly engaging or original. All of which brings us around to music I'm much more excited about. I haven't stopped listening to The Rough Guide to the Music of Morocco since posting about it last week, so be sure to check that out. love with its warm, soft sound. 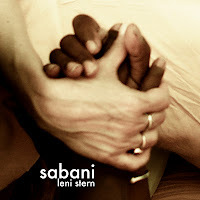 Along with her primary collaborators -- Haruna Samake and Mamadou Kone -- Stern has crafted eight engaging, lyrical songs. With lyrics in both English and unspecified African languages (Mande, I presume), the songs are more examples of the increasing tendency toward borderless music. The blending of Western and Jali instruments feels natural, a modern sound with deep roots in African tradition that support but don't constrain. The album is too short at 34 minutes, but they are a rich 34 minutes. Just check out the bluesy blend on "I Was Born (Ibe Keneya)" and you'll get a feel for their sound. Stern is currently on tour in the USA.